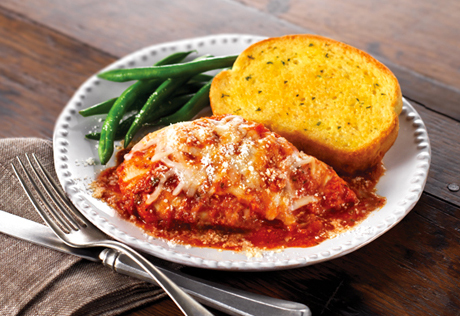 In less than an hour, you can make this simply delicious chicken dish, baked in a flavorful tomato sauce and topped with mozzarella and Parmesan cheeses. It's a winner! Heat the oven to 375°F. Pour the sauce into a 13 x 9 x 2-inch baking dish. Stir in half the Parmesan cheese. Add the chicken and turn to coat. Bake for 30 minutes. Sprinkle with the mozzarella cheese and remaining Parmesan cheese. Bake for 5 minutes or until the chicken is cooked through. Serve the chicken and sauce with the toast.